Propane autogas helps Flint, Mich., save money and cut emissions. 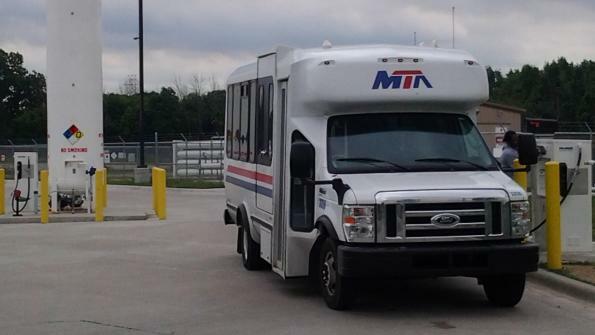 The Flint, Mich., Mass Transportation Authority (MTA) transports nearly 470,000 passengers through its paratransit service each year. The community relies on the MTA’s “Your Ride” curb-to-curb shuttle bus service within the city and Genesee County. As the fleet of shuttles aged, the MTA explored alternative fuels. Flint MTA selected the Ford E-450 cutaway equipped with the ROUSH CleanTech propane autogas fuel system. The versatility of the vehicle platform enabled the agency to enhance its bus features, including more passenger and wheelchair capacity. The 41-gallon fuel tanks provided the range required. As a Tier 1 supplier and Ford Qualified Vehicle Modifier manufacturer, ROUSH CleanTech’s vehicles retain both the original factory Ford warranty and the same quality Ford performance characteristics, such as horsepower, torque and towing. In addition, the Environmental Protection Agency and the California Air Resources Board certify the shuttles. MTA also considered the vehicle’s Altoona testing. This Federal Transit Administration (FTA) New Model Bus Testing Program rates new transit bus models on safety, structural integrity and durability, reliability, performance, maintainability, noise and fuel economy. Purchasing alternative fuel vehicles tested through Altoona allows eligibility for FTA funding. These federal funds cover 85 percent of the entire alternative fuel vehicle cost, with a 15 percent local match. The alternative fuel offers fuel savings of about 40 percent over gasoline and 50 percent over diesel. On average, the MTA saves $2.49 per gallon for propane compared to gasoline, and each propane-autogas-fueled shuttle emits nearly 20,400 fewer pounds of carbon dioxide. An MTA analysis during a one-month period showed the agency paid $.12 per mile for propane autogas compared to $.39 per mile for gasoline and $.41 per mile for diesel. Learn more about ROUSH CleanTech here.